Nestled deep in the beautiful Tuscan countryside, the Toscana Resort offers golfers traveling to explore one of Italy's most iconic regions. Once an abandoned 800 year old medieval village, Castelfalfi has been brought back to life and now offers those visiting Italy the chance to enjoy charming accommodation and hospitality, delicious cuisine and a challenging golf course; All the while surrounded by nature, a century-old history and a truly timeless landscape. Thanks to its temperate climate, Tuscany is an ideal destination for golf lovers as it allows you to play most of the year. The Golf Club Toscana Resort Castelfalfi is as challenging as it is beautiful. Set in the heavenly Tuscan landscape, boasting spectacular views, the 27 holes on the beach and the scratch player alike. Laid down by Rainer Preissmann and Wilfried Moroder, both associates of the European Institute of Golf Course Architects, the Mountain Course and Lake Course combines to offer 27 top quality holes of golf. The Mountain Course measures just shy of 7,000 yards from the back tees and offers the “championship test” at the resort. Its sweeping undulations, dramatic elevation changes and series of water hazards and devilishly placed bunkers will be a test for even the best golfers while less experienced players can enjoy the ride from forward tees. The 9 hole Lake Course offers a more relaxing test that will appeal to the beginner and yet, for a quick round of golf when 18 holes is just too much to handle, the better player will also appreciate the strategic challenge on offer here. An excellent driving range with genuine grass tees, as well as covered bays allows golfers to practice to their heart’s content and with a clubhouse that features a lovely terrace, there is also plenty of space for golfers to enjoy a post round drink or two in the evening Tuscan sun. 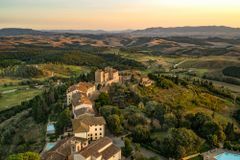 Hotel Il Castelfalfi is a new 5 star hotel in Toscana Resort Castelfalfi and is comprised of 120 luxurious rooms which are designed to give guests an exclusive holiday experience. The 645 square feet of hotel rooms are equipped with all modern amenities to make your stay memorable one. There are 67 Classic Rooms within the hotel, all of which are equipped with air conditioning, mini bar, TV and wifi in order to make sure your stay is as comfortable as possible. The room also offers incredible views of the beautiful countryside that surrounds them. The hotel also consists of 30 Deluxe Rooms and 15 Executive Rooms with them being roughly 35 square meters and 44 square meters respectively. The Executive Rooms come with their own armchairs and seating area from which guests can admire the wonderful vistas of the scenery that surround their room. Both rooms have a private bathroom with shower and hairdryer. Toscana Resort Castelfalfi is located in Castelfalfi, Italy. The hotel also has 8 lavishly designed suites which are an incredible option for guests who are looking to experience a completely new level of luxury. With 60 square meters of space, the rooms have their own living area, separate bedroom, working desk and sofa bed making it a wonderful option for those who want to enjoy the dream holiday destination as a family. The hotel also has 3 fabulous dining options to match the exceptional quality of the accommodation. The main restaurant is La Via Del Sale which serves exquisite authentic Italian cuisine and combines the freshest local produce with flawless recipes to make a superb dining experience for guests. In addition, for those who want to enjoy a few drinks, then the Ecru Bar has an extensive array of cocktails on the menu on top of a number of fine wines for you to enjoy. There is also Giglio Blu all day snack bar which provides guests with an informal and relaxed environment where they can soak up the spectacular Tuscan sunshine whilst enjoying a light lunch and few drinks. The Tabaccaia Hotel is located in the heart of the city, just a few steps from the beach. Ranging from standard guestrooms to lavish suites, the collection of 31 rooms are sure to cater for any requirements. All rooms are complete with high-speed Wi-Fi connection, LCD TV with satellite channels, air conditioning and a comfortable bathroom with rainfall shower while the authentic wooden beams and bricks that are still on a subtle reminder of the buildings history. At the hotel, guests can enjoy a continental buffet breakfast in the morning and in the afternoon; A cup of tea or glass of wine can be enjoyed at the bar. For those who want to enjoy pre dinner aperitif - aperitvo according to the locals - an American-style Happy Hour runs from late afternoon into the evening at the Lounge Bar. Toscana Resort Castefalfi is the perfect place to spend a relaxing holiday. The resort is surrounded by farmland and has a result, all of the produce used to create the delectable dishes on the Il Rosmarino Restaurant is supremely fresh and of the very highest quality. Open for lunch and dinner, this fantastic restaurant offers visiting golfers the chance to sample all of the famous flavors of the region, as well as fine oils and wines that are produced onsite at the resort. Known for its stunning landscapes, traditions, history, artistic legacy and its influence on high culture, Tuscany is a fascinating place to explore during your time away from the fairways.